Black Betty Goat Gouda for sale. Buy online at Zingerman's Mail Order. Gourmet Gifts. Food Gifts. 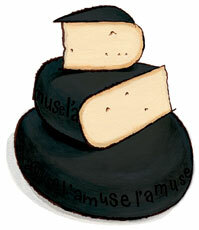 Every year Betty Koster of Holland’s L’Amuse Cheese Shop sets aside a small trove of her treasured Brabander goat gouda. Where most wheels are aged for six months, this group gets double that. The aging of all Brabander goat gouda is done in a facility that has very little climate control, like cheese rooms used to be. For a few days in the summer they might turn on the air conditioning to keep it from overheating, but otherwise the cheese is allowed to mature at whatever seasonal conditions happen to blow through the windows. The old-school environmentally-low-impact aging makes cheese that has seasonality and takes a careful palate to master. Here, all the great elements of Brabander are amplified. The caramel. The grass. The milkshake richness. When it’s gone that’s it till next year.